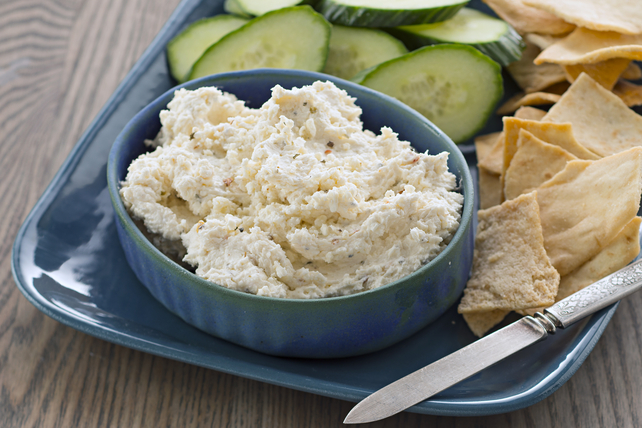 Combine 2 ingredients - PHILADELPHIA Cream Cheese and KRAFT Feta Cheese to make this easy spread at your next get-together. Mash feta with fork to form small pieces; place in food processor. Add cream cheese; process until blended. Serve with cucumber slices, assorted crackers and pita chips. This savoury spread can be prepared ahead of time. Refrigerate up to 24 hours before serving. Spread onto toasted baguette slices; top with roasted tomatoes, fresh basil and a drizzle of roasted garlic oil.